Nowruz means new day, and people who live in different provinces of Afghanistan have different customs to celebrate this first day of spring. People who live in the capital of Afghanistan work very hard for the coming of Nowruz by washing all their rugs and everything around their house. They interpret this as a sign of cleanliness and the discarding of filthiness, dirt, and suffering. They start Nowruz with a new life without any sorrow or horror, but with peace. The people always buy new clothes and visit their families. Our family celebrates by cooking spinach on the first night of Nowruz, which is March 20, so we will have a green and clean environment during the coming year. 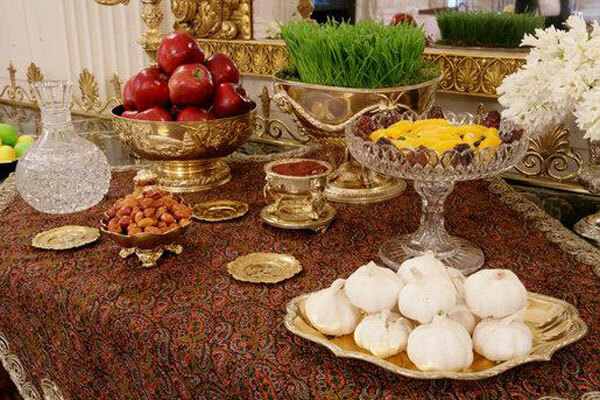 On the first night of Nowruz we put spinach, red apples, honey, boiled eggs, garlic, and candles on our dinner table. The apple’s red color means we will have success in our work; honey is the sign of amiability in our relations, boiled eggs are the sign of abundance, garlic is the sign of family health, and a candle is the sign of light in our lives. Each year I feel passionate about the coming of Nowruz. But this year was even better than usual. I love to have a sunny Nowruz. I woke up early and when I opened my eyes, the golden sun was shining on my bed forcing me to wake up and smell the fragrance of spring. The day was warm and it gave me a feeling of hope for the coming year. It seems that whenever I wish for something, it will happen for me, so I know I will have a wonderful year! I love the detail in this piece – it’s very vivid! The writing makes it easy to imagine waking up and anticipating the Nowruz celebration. I wish you a good year full or peace and happy times. I love your use of colors to describe the food and the sun – it makes me feel happy all over! It seems like Afghan’s way of celebrating the new year is very similar to Chinese’s (I’m Chinese) – we buy new clothes, visit our relatives, cook and eat lots of food that have special meanings and just be happy that the new year brings a new beginning. Okay, now I’m wishing it’s time to celebrate the Chinese New Year. I love how detailed this writing is. I can almost taste the food that you are describing. I do hope that all your wishes come true this year! I was lucky to be able to visit Kabul during Nowruz 3 years ago and this beautiful essay brought back wonderful memories of the Nowruz feast! Thank you for writing such a wonderful essay that shares such an interesting tradition. My favorite line is “the golden sun was shining on my bed forcing me to wake up to the fragrance of spring.” I love the way you have included all of the senses – sight, touch, smell – in this sentence! Your stories were very inspirational. I read most of your stories, and each one built off each other, and I believe I got a good idea of your person. I would like to commend you for your tireless work and contributions to the world. Stories like yours, basing emphasis on education and family, are needed for today’s society. When there are so many stories of women being married off, girls dropping out of school, and young boys being worked to death, your journey gives me hope. Modern slavery is prominent in your part of the world, I am glad it was never part of your journey. Anyway, one point of interest for me in your writing, was the secret libraries. It’s nice you at least had access to book when the Taliban came in and stopped your positive lifestyle. Even after getting out of there, you were able to have growth in your person. You never stopped your education, while never neglecting your family. I hope your father is well, as he seemed to have a positive influence on your journey. Most importantly, I would again like to commend you on your contributions to your community. We need more strong, supportive leaders like that in all areas, but especially where you are. The advice and education you give to the girls who come to changes not only their lives, but the world. Your programs are creating a pocket of life where girls can prosper and reach their full potential. When girls are growing, the community is strengthening. It was a beautiful thing for you to give back to your community after your education. You are lowering poverty and death rates by educating girls. But the biggest thing is that you are raising individuals’ quality of life. I think this was a wonderful piece of work, and I can see every detail! You have an amazing writing style!